The nostalgia for the 50s that became popular once again in the early to mid-70s brought us many cultural phenomena during that decade: sock hops, Happy Days, Grease, American Graffiti, even Wolfman Jack. A curious by-product of this retro look at a simpler time was created by a man named Dickie Goodman. In 1956, he created the first cut-in record when he released with Bill Buchanan (as Buchanan & Goodman), The Flying Saucer Part 1 & 2. It hit #3 and was the biggest hit of his career. He would only hit the Top 10 once more, almost 20 years later, with Mr. Jaws. But what is exactly is a cut-in record? 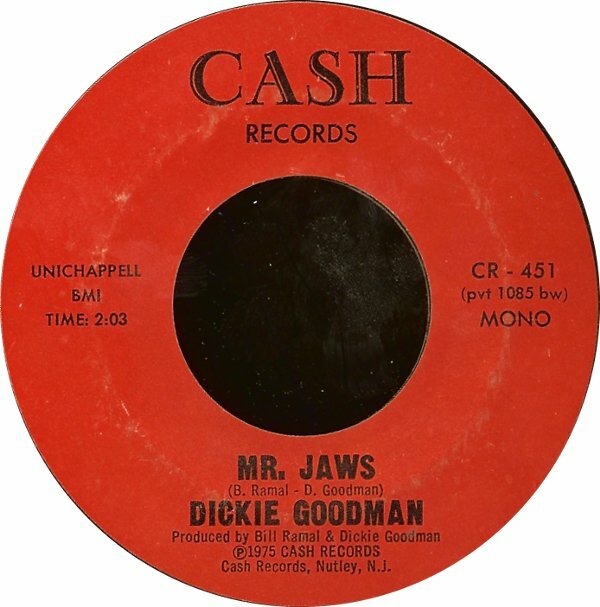 A cut-in record or break-in, as some call it, was a technique created by some fooling by Dickie & Bill and was an early precursor to sampling, albeit in a roundabout way. Dickie’s cut-in record records had a simple formula. One person would be a reporter, such as a TV anchor or on-the-scene broadcaster. They would ask the person with whom they were speaking a question, in which the response would be a piece of a popular song. The subject would always be something very current as would the song response. Flying saucers and the promise of space travel were a big curiosity in the 50s. Jaws, the movie, was an unprecedented Summer blockbuster in 1975, so much so that even the John Williams duh-nuh duh-nuh duh-nuh theme made the Top 40. Back then, media backlash or spoof wasn’t nearly as instantaneous as it is now. Outside of Saturday Night Live, which debuted in late 1975, all you had was a novelty artist like Ray Stevens or Dickie Goodman. Jaws became so popular so fast, it was only a matter of time. (SNL eventually got their chance too, with the classic Candygram sketch). If you never heard this 45 before, you may not understand why it’s so funny. I thought it was hilarious, the first time I heard on the Dr. Demento show. I would sit around with my friends huddled by a little tape recorder playing and rewinding the song over and over anticipating each song response as if it were the funniest punchline in the world. Dickie interviews Mr. Jaws, Brody, Hooper and Capt Quint and finishes up with the shark who eats finally eats Dickie and pulls him underwater. They don’t make songs like this anymore for 2 big reasons. The first being that in the early 80s, radio stations began broadcasting ‘morning zoos’ which pump up out a few parody pieces a day, quicker, funnier and sometimes racier. The second reason has to do with sampling itself. Damn those artists who wanted publishing and songwriting credits for using pieces of their material in someone else’s. What was once an aural collage became thievery, with precedents set in the legal system (look up Biz Markie V. Gilbert O’Sullivan or Beastie Boys V. Jimmy Castor) Which makes a record like this, ‘written’ by Dickie Goodman a rarity in itself. What’s amazing about “Mr. Jaws” to me is that it wasn’t confined to the ghetto of wacky morning shows, where novelty songs live today. It was in the hot rotation at Top 40 stations right alongside the biggest hits of the day, reaching #4 in Billboard and #1 in Cash Box. The sampling problem has made reissues of Goodman’s stuff challenging. His son produced a compilation a year or two ago, and a few of the song snippets have been replaced with soundalike versions, presumably because they couldn’t clear the originals. how right, JB. I have the Jaws LP which is basically a comp of Dickie through the ages and the solo Beatle snippets are definitely not the original. And it’s dawning on me that 1975 is to me what 1976 is to JB. I still have that record but the font and logo for CASH RECORDS is different. Thanks for dredging up that memory. It was so very long ago. My aunt did something like this for her workplace back in the 80s. I helped her by recording the music samples onto a cassette, and she could just hit play and stop on the cassette player at the appropriate times as she gave her talk. I don’t remember most of the songs we used, but I do remember using Peter Gabriel’s “We Do What We’re Told”, from his So album. It seemed quite appropriate for a workplace! I haven’t heard this since 1976. Suddenely I’m 8 years old again. Awesome to listen to again. Haven’t heard it since the 70’s and I’m in my 50’s! !